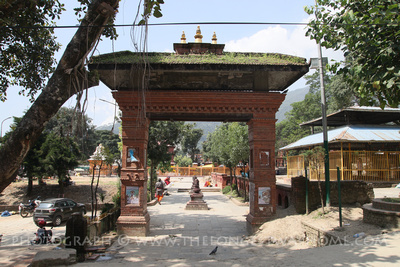 Budhanilkantha is located 8km north of Kathmandu in the village of Narayanthan. It sits just at the foot of forested peak of Shivapuri, a popular hike offering weather dependant views of the Himalayas. 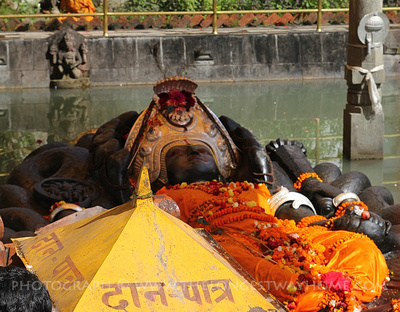 Budhanilkantha is famous for it's temple which is an open pond that has a large reclining stone statue of Vishnu at the center. Today Budhanilkantha is a popular site for both Hindu and Buddhist pilgrims and tourists to visit the famous statue. For general tourists there's not a lot to do unless it's a stop off on the way to Shivapuri. Though if you do have a morning free you can tick off the bucket list of having visiting Nepal's largest statue! There's are several small local Nepali style restaurants in the area and little shops for water and snacks. The area is otherwise a typical concrete style town/village. .
Vishnu is often depicted as having a pale blue complexion and having four arms. Despite the name having similarities to Buddha, Budhanilkantha actually means “Old Blue Throat”. Budhanilkantha statue itself has several stories behind it that are noteworthy. There is some evidence that states it was sculpted in the 7th century and brought to the area by Vishnu Gupta who was under the Licchavi king Bhimarjuna Dev. Another story tells of a farmer and his wife ploughing a field when they hit a stone which started to bleed. The dug up the stone only to discover it was the lost Budhanilkantha statue. It was then moved to its present location. No kings of Nepal have visited Budhanilkantha since king Pratap Malla (1641–1674) had a vision. It was revealed to him that any king that visited the temple would die. Since then, none have visited it. Finally in regards to the "floating" aspect of the statue. There have been many attempts by scientists and archaeologists to examine the statue and determine what it's made from along with verifying if it does indeed float. Virtually all investigations have been blocked on religious grounds as the statue should not be interfered with. However, one test carried out on a chip of stone from the statue suggested it's silica based. Similar to lava and may indeed have the properties needed to float. Budhanilkantha temple is an open area with no roof. You enter through a stone gate and to the left is a large painted concrete fence. Below the fence is a long pond where the statue of Vishnu lies just above the surface. Made from black basalt the Vishnu as Narayan statue itself is 5 meters tall (16.4 feet). The statue lies on a best of stone snakes and is dressed in robes often having red tika around it. The statue bears a headdress with an image of Buddha at the center. This image is important as it symbolizes both Hindu and Buddhist beliefs. There is one entrance down to the statue and one exit on the opposite side. There is some conjecture whether "foreigners" are allowed down to the statue itself or not. The common consensus is they are so long as they are dressed respectfully, act respectfully and don't take photographs. However, the guards can be jumpy and are certainly not used to tourists. You can just about get a clear view of the statue from between the fence. Surrounding the outer concrete fence are several smaller shrines to Shiva, Saraswoti and Ganesh. There are often animal sacrifices here, especially on a Saturday morning. There is currently no entrance fee to Budhanilkantha. This may well change in the foreseeable future. 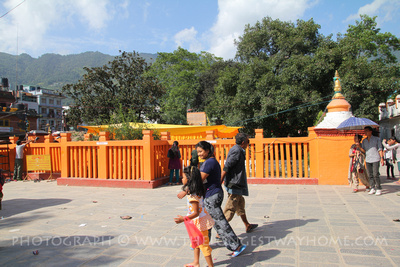 Keep in mind that non-Hindus are often told they cannot visit the statue yet the statue is open to Nepali Buddhists. The guards are often not used to dealing with tourists and stick with the safer option. Having a Nepali speaking friend with you may help. During the Haribondhini Ekadashi Mela festival thousands of pilgrims visit the temple as this is said to be when Vishnu wakens from his deep sleep. It's probably best not to visit then due to the huge crowds. The festival takes place on the 11th day of the Hindu month of Kartika which is in October–November. If you are visiting Nepal then, ask if the festival is taking place as the exact date moves slightly. Note: cameras and mobile are not allowed inside the actual pond area. You can photograph within the compound and outside the fence. Taxi: It takes a good 30-40 minutes to reach Narayanthan from Kathmandu due to the mess of traffic on the way. Going early in the morning helps to avoid this. Bus: Microvans leave from Lazimpath and Kantipath for 20+ ruppes every 5 minutes. The microvans are empty near Civil Mall compared to Lazimpath. You'll need to ask the conductor for Narayanthan. There is a small bus park near the gates to Budhanilkantha. If you are Hindu, Buddhist or have faith or an interest in Vishnu then Budhanilkantha is pretty much a must visit destination. If you already visited many temples and heritages sties in Kathmandu then a dedicated trip to Budhanilkantha may end up slightly underwhelming. Most of this is due to Kathmandu's traffic build up. If you are on the way to Shivapuri then a stop off at Budhanilkantha is certainly well worth it. Liked this page? You'll love my books! They are hands on guidebooks that are better than the rest. Yes, really! In them I cover all attractions with step-by-step accuracy using well researched information, photographs and travel tested walking tours. They are interactive & printable guidebooks like no other. Was this page helpful to you? If so please tell others! » How much does a trek in Nepal cost? » What's the best travel insurance for trekking in Nepal? » Get my full guidebook to Patan! » Get my full guidebook to Bhaktapur! » Get my full guidebook to Pokhara! » Download my Guidebook to Chitwan! » Download my Guidebook to Bardia! » Download my Guidebook to Lumbini! » What would it be like to live in Nepal? Everything here is 100% original. That's a lot of digital ink! I also, always, pay my own way. No exceptions, ever.